I have been messing around with this concept for quite a while now, making little changes here and there. I have changed out the herbs, the wine, how long I cooked the beef, the cut of beef. You name it. I have made it for my parents, Justin's mom, and just for us in its many versions through trial and error. We were able to procure some Wagyu beef. It was not planned at all. 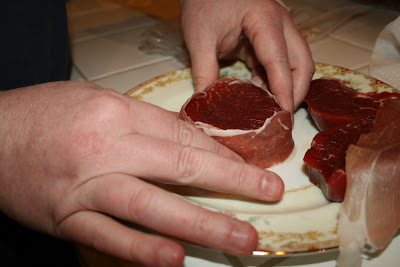 We had asked for a regular beef tenderloin, but found out that some American Wagyu was available. Wagyu is a special type of beef. The cows were originally bred in Japan and they are prized much like Kobe. American Wagyu is a cross breed of Angus and Japanese Wagyu cattle. Wagyu beef has more marbling and a distinct flavor difference. I happen to really like the flavor. Last night, as I made dinner, I kept thinking "This is going to be good!" The night before, I used some of the smaller pieces off the tenderloin to make Red Curry with Beef and Thai Beef Eggplant Salad with jasmine rice. It was so good! As the beef seared, I could see a difference in color. 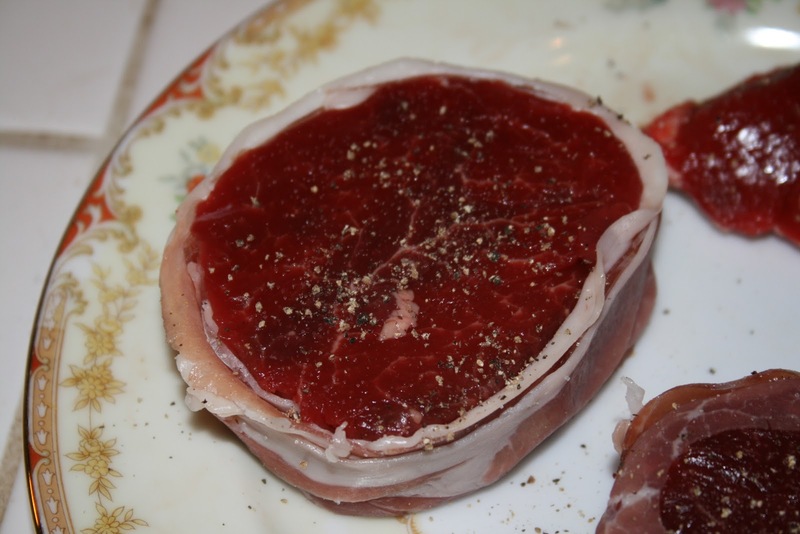 The cooked Wagyu beef is slightly lighter than regular beef. I used a bottle of wine we'd been saving for the last 4 years. It was an Ameritage (American red wine blend) that was fairly good. 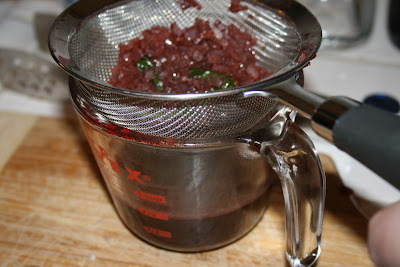 I strained the wine reduction, and was pleased with the results. The flavor was pretty good, better than the other Cabernet Sauvignon's I tried in the past. Let me just say this about cooking with wine. If you don't like to drink it, it will taste horrible cooked with your food. If it's good to drink, it will be great in your food. 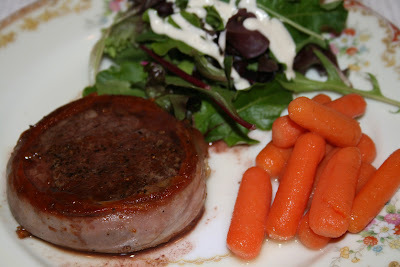 I plated dinner, took some photos, then sat down to eat. This was by far the best and all I could think was Slam-Dunk! 1. Wrap the prosciutto around the edges of each steak. Do it snugly so the prosciutto adheres well. If the single slice of prosciutto doesn't fit all the way around, use another small piece to cover the gap. Season the tops and bottoms with pepper. Salt is not necessary. 2. Heat your frying pan over medium-high heat with about 2 Tablespoons olive oil. When hot, add your filets. 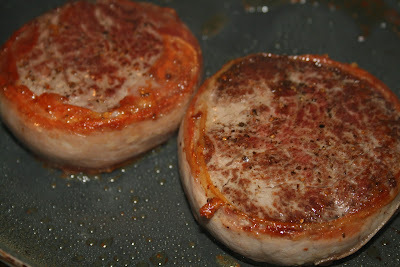 Let them sear for 3 minutes on each side. Don't move them around or they won't get a nice sear. 3. Remove filets from the hot pan and transfer to a warm dish and let rest in a hot-ish oven (350 - 400F) while you make the sauce. This will help to cook the beef more if you don't like it super rare. If you like it to moo at you, then just cover the dish with foil and let them sit near the stove so they stay warm. 4. 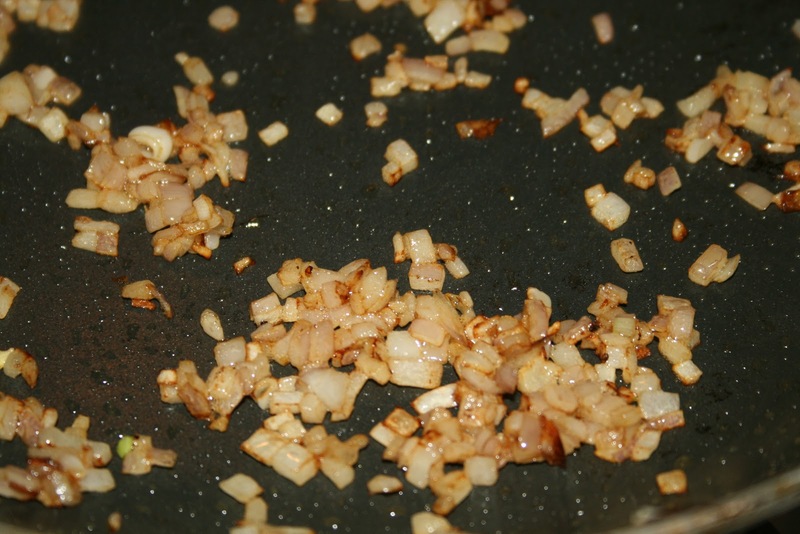 Toss the shallots in the pan and saute until browned and mostly translucent, about 2 minutes. 5. Pour wine into the hot pan. Careful, it will sizzle! Add the basil. Boil until the wine has reduce by half. You can reduce it more if you like thicker sauce, but I like it this way. It should only take 3-4 minutes at a good boil. 6. Strain the wine reduction sauce. 7. Serve filets with wine reduction in a nice mini pitcher. I like to plate this with a cooked vegetable and a salad. 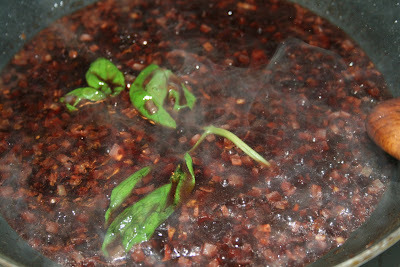 The wine reduction is also really good on the salad with a little splash of vinegar.